Robert E Howard’s Conan stories were the first fantasy, or more accurately Sword and Sorcery, stories that I read as a child, and Roy Thomas’ adaptations of those tales for Marvel were among the first comics I remember reading. 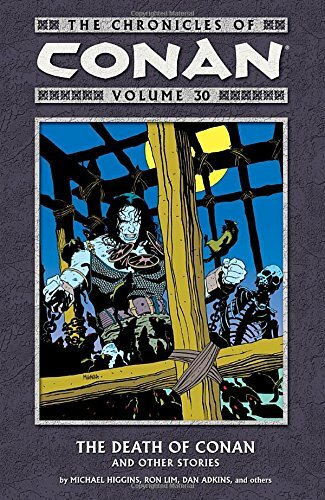 I was entranced and captivated by both, and to this day, both are a staple part of my literary diet; I couldn’t realistically count the number of times that I’ve returned to the comics and collected volumes of the Cimmerian’s escapades, reading, and thoroughly enjoying, them time and time and time again. 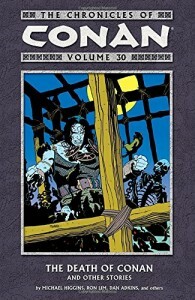 ‘The Death of Conan’ collects one of the later story arcs, originally published at the tail end of 1990 and into the beginning of 1991, that appeared less than two years before Marvel cancelled the book for good. By this time Roy Thomas had long since departed (and I’d stopped reading the comic as alcohol, punk rock and women had started me on my journey down the long and winding path to wrack and ruin), and Michael Higgins and Justin Arthur had assumed writing duties and in doing so, decided to explore the character’s origin and his early days as a sword for hire, adventurer and thief.